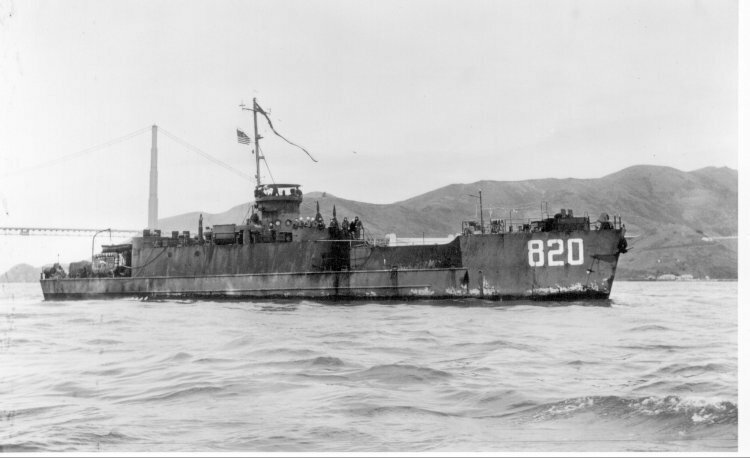 LCI(L)-351 Class Landing Craft Infantry (Large): Laid down, (date and place unknown); Launched (date unknown); Commissioned USS LCI(L)-820, 29 September 1944. During World War II LCI(L)-820 was assigned to the Asiatic-Pacific Theater. Decommissioned, (date unknown); Struck from the Naval Register, (date unknown); Transferred to the Maritime Commission for disposal, 26 January 1948; Final Disposition, fate unknown. LCI(L) Armament five single 20mm guns, one bow mounted, one each port and starboard forward of wheelhouse, one each port and starboard aft of wheelhouse, on some LCIs two .50 cal machine guns were added; Armament five single 20mm guns two forward, one amidship, two aft, on some LCIs two .50 cal machine guns were added; Fuel Capacity, 130 tons, lube oil 200 gal. ; Propulsion, two sets of 4 GM diesels, 4 per shaft, BHP 1,600, twin variable pitch propellers.